In Hampshire we are fortunate enough to have records for all of the UK’s 17 breeding species of bats. This includes the more common species such as the pipistrelles and brown long-eared bat, but we also have much rarer species such as the barbastelle bat (which is restricted to sites in southern and central England and Wales) and Bechstein’s bat (found only in southern Wales and parts of southern England, where it is at the northernmost edge of its distribution). In fact, these are two of the rarest bats in Europe. Our first records of the alcathoe bat were added in 2017. The UK's 18th species, the sole surviving Greater Mouse-Eared bat, lives nearby in West Sussex. The New Forest is particularly important for barbastelle and Bechstein's bats and work to assess their status and distribution has been conducted by the bat group and its partners since 2006. There are also important populations of these two rarities in south-east Hampshire. In the north of the county, the Greywell Tunnel on the Basingstoke Canal hosts the largest congregation of hibernating Natterer’s bats in the UK and is a site of European importance. Although we continue to collate records annually across the county there are still many areas where we would like to know much more about the bat populations, both in the countryside and in the towns and villages of Hampshire. Bats need a variety of habitats for their survival. In the winter they need moist, cool places to hibernate and man made structures such as tunnels or mines can be ideal. In the summer they need warm, dry places in which to raise their young and some species can be found in buildings during this time. Other species however, including the Bechstein’s bat, tend to prefer woodland and often use woodpecker holes for their roosts. Regardless of roost preferences, all bats eat insects and so they all need insect-rich places in which to feed. 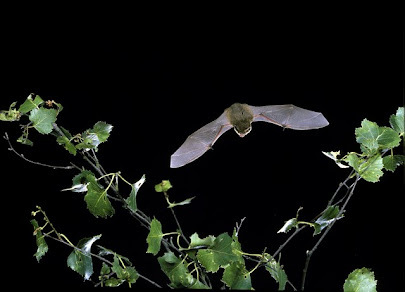 The woodlands, hedgerows, pasture, rivers and canals of our county offer good foraging sites but many bats can also be seen feeding in our gardens and streets. Wherever you live in Hampshire, the chances are that bats will not be far away! The Hampshire Species Action Plans for each of the five priority species can be downloaded in full at the bottom of this page. Don't forget, if you live in Hampshire, YOU can help protect these species! Have a look at our Bat Conservation - What can you do? page to get started! The barbastelle bat is considered to be rare both in the UK and throughout its range. The barbastelle bat has been identified by the UK Biodiversity steering group report as a species that requires conservation action and is listed on the priority list of the UK Biodiversity Action Plan. Due to its occurrence in Hampshire, the Hampshire Biodiversity Partnership has identified this bat as a species requiring action in Hampshire. listed on the priority list of the UK Biodiversity Action Plan. The Hampshire Biodiversity Partnership has identified the greater horseshoe bat as a species requiring action in Hampshire. The Hampshire Biodiversity Partnership has identified the Serotine bat Eptesicus serotinus as a species requiring action in Hampshire. ‘priority’ list of the UK Biodiversity Action Plan. A UK species action plan for Bechstein’s bat was published in volume 1 (page 39) of the UK Biodiversity Group Tranche 2 Action Plans. The Hampshire Biodiversity Partnership has identified Bechstein's bat as a species requiring urgent action in Hampshire. The Common Pipistrelle bat has been identified by the UK Biodiversity Steering Group as a species that requires conservation action, and it is on the priority list of the UK Biodiversity Action Plan. A species action plan for Pipistrelle bat was published as part of Tranche 1 of UK action plans in Biodiversity: The UK Steering Group Report, Volume 2 (page 89). The Hampshire Biodiversity Partnership has identified the Pipistrelle as a species requiring action in Hampshire.